From the moment I heard about it, I had wanted to go to Lalibela to see the famous rock-hewn churches dating from the 13th century. Beyond being one of the most important historical sites in Ethiopia, classified by UNESCO as World Heritage, Lalibela is still a living city and one of the Christian Orthodox centres in the country. 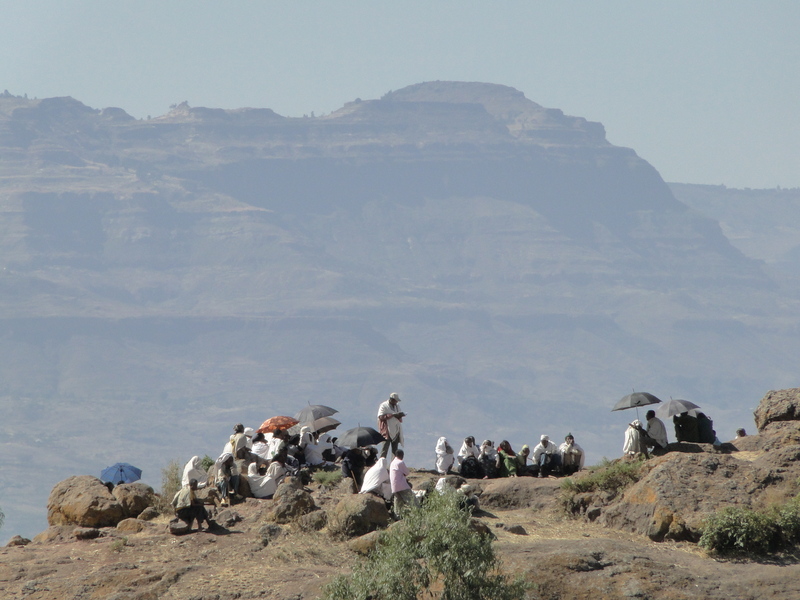 During religious festivals such as Epiphany (Timkat in Amharic) or Easter, pilgrims from all over the country gather there. The story goes back to the 13th century when King Lalibela, the then ruler of Abyssinia, decided to create a new Jerusalem (supposedly after he had visited the Holy City). He had 11 churches, each dedicated to a different saint, carved into the rock. The churches are divided into two groups separated by a narrow river, named Jordan, after the famous Jordan river in Palestine. They are all interconnected by amazing secret passages and tunnels. According to our guide, the churches were chiselled by hand in a period of only 20 years, with “the help of angels”. One of them, the most impressive of all, stands alone away from the other two groups. It is Bet Gyorgis, or the “House of George” (Saint George’s). 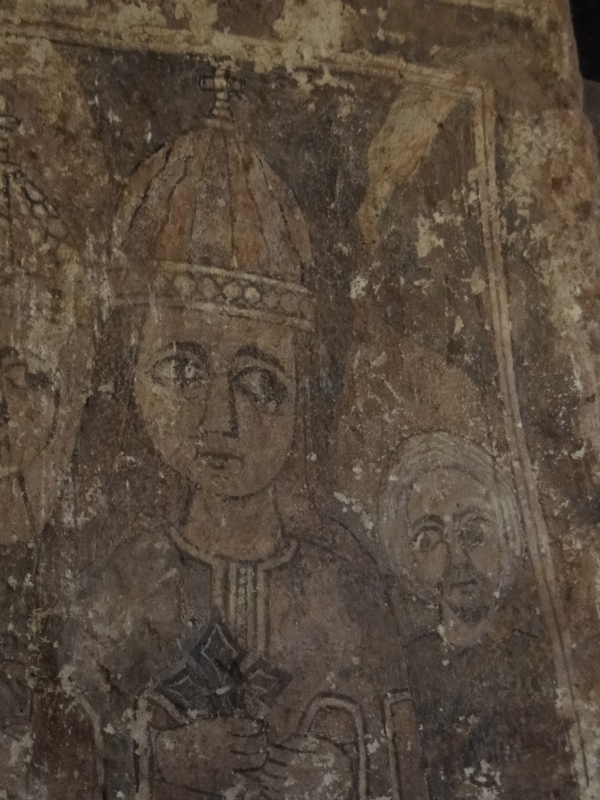 According to the legend, when King Lalibela had finished building the two groups of churches, St George came to visit him to ask him why he hadn’t dedicated a church to him. 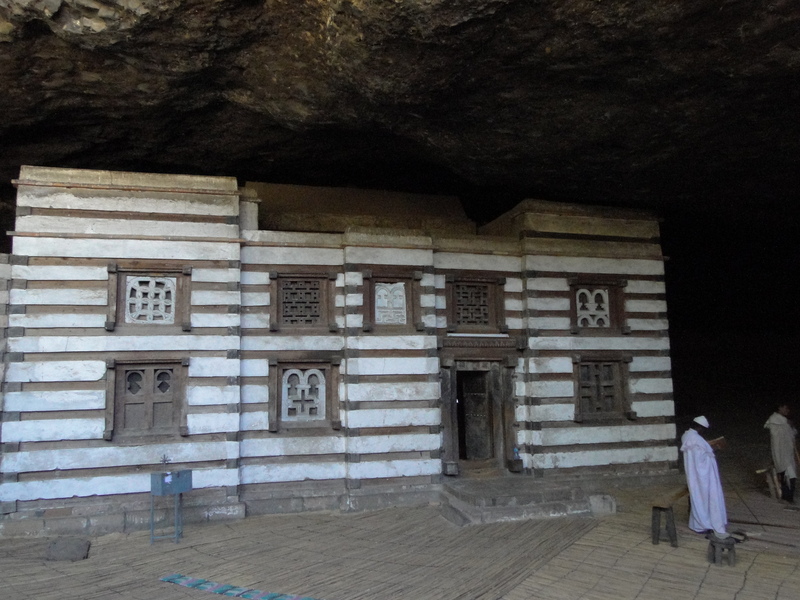 In reply, Lalibela said that he would build the best one for him. Today, St George’s is still the best preserved of all the churches. It becomes the centre of a pilgrimage on St George’s day (25 January), and from what I was told, it is a very interesting time to visit it. Visitors in Lalibela are advised to take one of the official guides to tour the churches, and I must say it was very useful to do so. Without help, it is almost impossible to find all the secret ways and tunnels to go from one church to another, and we would miss out on the many explanations, particularly on the specific symbolism of each church. Also, by hiring a guide, visitors contribute to the livelihoods of local people. 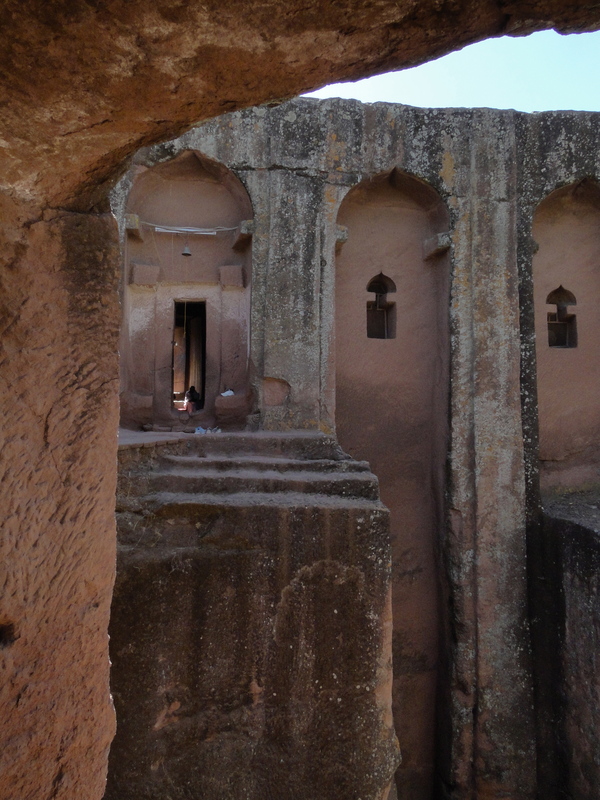 Lalibela is still a very poor city in a poor and arid region, located about 2,600 metres high in the middle of the dry high-plateaux and connected to the outer world by a single gravel road. 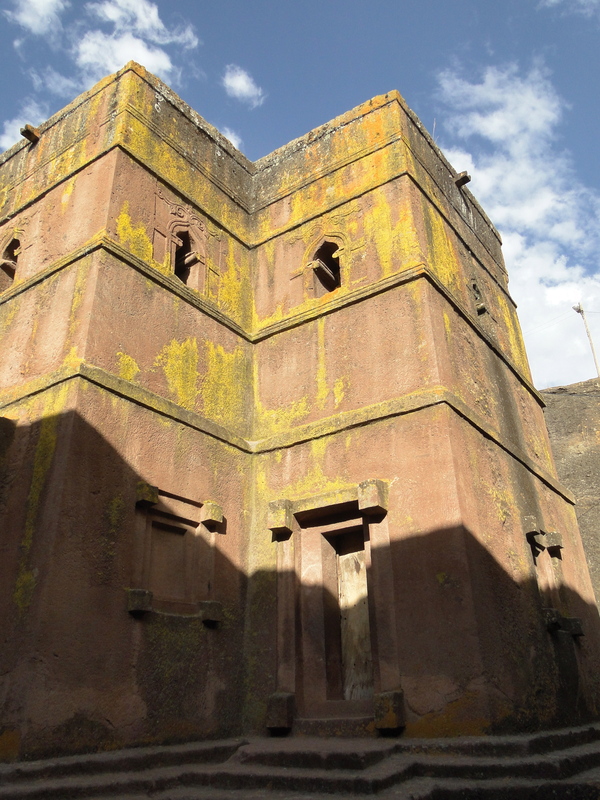 Until very recently, it was not possible to visit Lalibela during the rainy season in the summer. Today, there is a small airport about 25 kilometres from the town, which connects the region to Addis Ababa and other regional cities and enables visitors to go there all year around. Initially, I was a little frustrated to fly in and out of Lalibela without driving part of the journey to see more of the country. However, after I got there I realized that it would be a long and arduous drive (two days from Addis without many places to stop in-between). As we arrived, we went on the 40-minute drive uphill from the airport to the town across the arid landscape and through scattered hamlets. That was enough to give us an idea of how remote Lalibela is. Along the way, we saw many people walking towards town for the weekly market (it was a saturday) to sell the few produce they had. One women had walked two hours to sell no more than two chickens. Life in this rural part of Ethiopia hasn’t changed in a thousand years, the small round houses, known as tukul, are the same as they ever were. The landscape however is stunning. I could even use the overused word awesome in that case, as it is awesome. The horizon from the top of the mountain is limitless. To enjoy it even better, we ended up in Ben Ababa for the evening, a wacky bar and restaurant just opened. 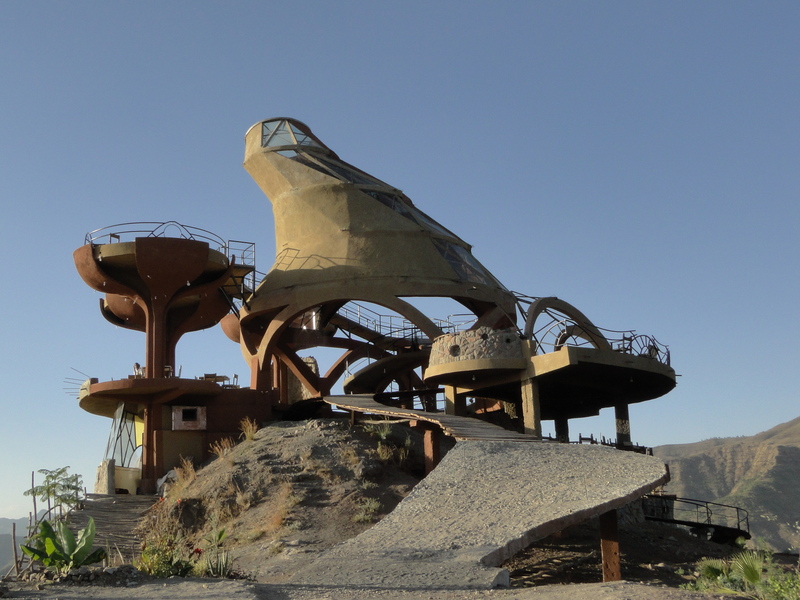 Out of this world, like the rest of Lalibela! 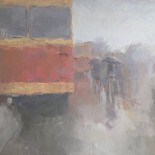 This entry was posted on February 23, 2012 by Salambo in Lalibela, Travelling outside Addis and tagged bet emanuel, bet gabriel, bet gyorgis, bet medhane alem, bet raphael, christian orthodox, Ethiopia, ethiopian orthodox faith, lalibela, new jerusalem, rock hewn churches, yimrhanne kristos monastery.